Free download for registered 6.0/6.1/6.2 users. $19.95 Upgrade from version 4 or 5. This screenshot of the Print Preview shows the Bitmap Scaling at work. This image is automatically enlarged to use more of the paper - especially handy with small images on high-resolution printers. The image being printed happens to be a screenshot of the new Auto-Update wizard..
Automatic Update - ClipMate can now (if you allow) check for program updates in the background and notify you when updates are available. See Automatic Update for full details. 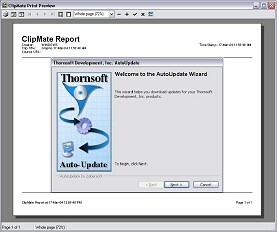 Comprehensive Database Recovery - eliminates database corruption more effectively than the repair feature in previous versions of ClipMate 6. Printing Enhancement - Bitmap Scaling - When you print small bitmaps, they can now be scaled up to use more of the paper, instead of printing at native printer resolution. The print routine will scale smaller bitmaps up, if there's room. If there isn't room, it will print as large as possible, given the space. New menu options: Expand All and Collapse All, allow you to quickly expand or collapse the collection tree, in ClipMate Explorer. Improved registration key input dialog box. URL Highlighting - The preview/edit window, which highlights URLS automatically, can now handle URLS longer than 255 characters (yes, we found examples of really, really, long URLs), and it can also handle URLs with quotes, periods, curly braces, etc.. Anything except spaces, tabs, or <> brackets. Improvements to the "KeepAlive" function, which automatically detects and corrects broken clipboard connections. Previous versions could cause problems (repeated captures or rejects) if the KeepAlive acted too quickly. The "show non-printing characters" option now is remembered between sessions. There is now a new global hotkey for "show current clip". This opens a floating window, viewing/editing the current clip. Default: Ctrl+Alt+F2, and you can re-assign as needed (we like F2). You can now add the "explode into fragments" PowerPaste option to the Classic toolbar. Here is a list of fixes for 6.3, from our tracking database. For information about upgrading from v5 to v6, see: this page.